We at Tri-Pups inc. recently had an opportunity to work with DRI-core, a sub-floor panel that is designed to raise your finished floor off of a concrete surface. Most of the big-boxes like Lowes and Home Depot sell DRI-core, and the pricing is about $1.65 per square foot. DRI-core is especially useful in basement finishing which is where we used it. 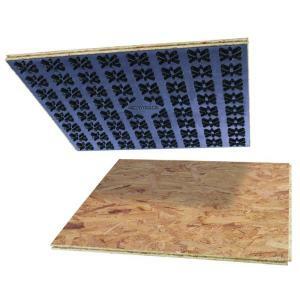 The bottoms of the OSB panels are composed of a moisture barrier (plastic) that is raised. 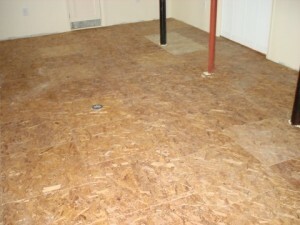 This allows any water that may seep into the floor to run under the panels to a drain, keeping the floor above it dry. 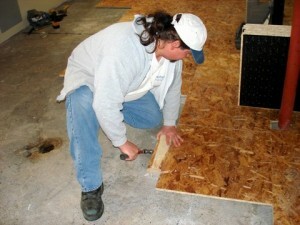 The panels are strong enough so that the floor does not have to be totally level. The Manufacturer specifications recommend that you level the floor prior to installation, but we found for practical purposes that we were able to just apply floor leveler to the worst areas and that the boards and shims could span anything else we encountered. Since the flooring we were installing was to be carpet, rather than hardwood or a laminate finish, we knew that we had a little wiggle room with the leveling process. Did I forget to mention that this was probably one of the most unlevel basement concrete floors I have ever seen? The concrete looked like it was poured by a bunch of drunken bums! The DRI-core panels are Tongue-and-Grooved like hardwood, so they are direction-oriented (right or left handed). You have to keep this in mind when you are making your cuts around the perimeter or you will wind up wasting panels. You also have to anchor the perimeter in order to stretch carpet. We usedRamset nails rather than screws to save time and cost. The photos below show Ted installing a DRI-core panel, and a partial picture of the finished room. Note the drain in the center of the DRI-core in the finished picture. We left the existing drain open, and installed an extra cover on the finished DRI-core to note the location of the drain. There is actually a 1-1/2” air gap at this particular point. Now if the drain needs to be worked on or used in the future, it is clearly identified and accessible. The floor is now ready for Carpet installation!